Why did the ‘star’ pitchers get left out? Interestingly, the names of Fernando Valenzuela, Orel Hershiser, and Ramon Martinez were left out – all Dodger aces, of course – even though they had done the same thing before too! 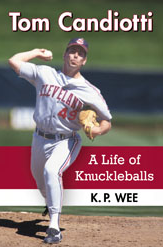 I had referenced Dodger starting pitchers who gave up 10+ runs on this website a year ago, just before my book on Tom Candiotti was officially released. 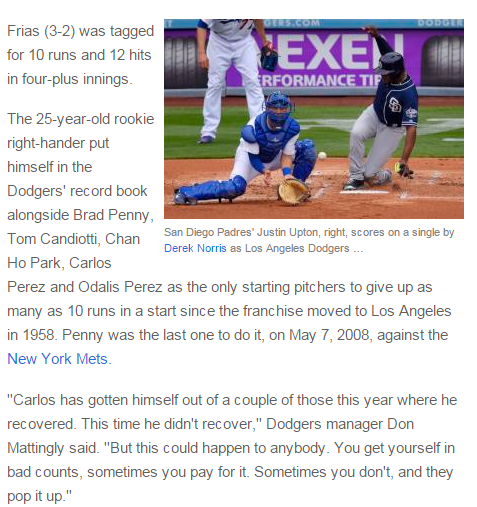 Interestingly, Candiotti was not the only Dodger starter to give up that many runs in a single game that season. Just one month earlier, on July 2, Dodger ace Ramon Martinez allowed 10 runs over 4.2 innings in a 10-1 loss to Colorado at Dodger Stadium. Also, Candiotti and Martinez were not the only prominent Los Angeles starters to be tagged for 10 or more runs in a single game. On August 9, 1992, Orel Hershiser also gave up 10 runs over 4.2 innings in Atlanta. Back on June 29, 1983, Fernando Valenzuela surrendered 10 runs in 4.1 innings of work in San Diego. Ismael Valdez (10 runs in Houston in 1998) and Chan Ho Park (11 runs in Los Angeles versus the Cardinals in 1999; 10 runs in Colorado in 1998) would later accomplish the feat as well. It happens. Now, the AP story didn’t include Valdez either, and that’s just poor reporting. It’s not like Martinez, Hershiser, Valenzuela, et al, pitched in the 1900s or 1910s, when record keeping was not reliable, for crying out loud! This just goes to show that sometimes you can’t believe every story you read… But, oh well, to echo what I’d said in that other post I’d written… It happens.